We all know about this amazing new feature from Apple called 'Siri' which is officially exclusive to iPhone 4S. What is Siri? you may ask. Siri is a new feature that lets you use your voice to send messages, schedule meetings, place phone calls, and more. Ask Siri to do things just by talking the way you talk. Siri understands what you say, knows what you mean, and even talks back. Siri is so easy to use and does so much, you’ll keep finding more and more ways to use it. 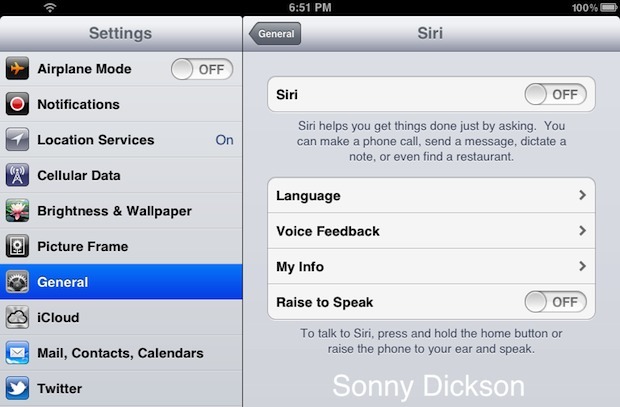 Now today, a developer named Sony Dickson posted a tweet on his Twitter account along with a picture that shows Siri inside iPad 2. I just hope Apple pushes out siri to devices like iPhone 4 and iPad 2 officially in the next iOS 5.1 firmware update. But if not, I'm sure developers and jailbreaking communities will surely port siri to these devices unofficially. 0 Respones to "Siri Soon Coming to iPad 2 [Screenshot]"